The Baghdad government and its paramilitary forces increasingly see American troop presence as the actual foreign menace. 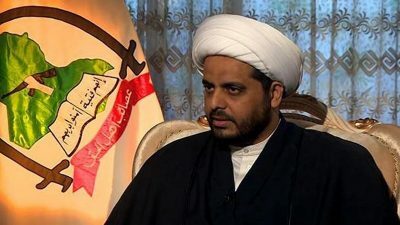 “Your forces should get ready to get out of our country once the excuse of Daesh’s presence is over,” said Sheikh Qais al-Khazali, the commander of the Shiite PMU group Asaib (Popular Mobilization Unit), through the group’s TV channel on Monday. The threatening statement was issued the same day Iraqi Prime Minister Haider al-Abadi publicly rejected Secretary of State Rex Tillerson‘s earlier suggestion that Iraqi paramilitary units who have for years fought Islamic State terrorists are actually “Iranian” and not Iraqi nationals. On Sunday Tillerson controversially asserted that Iranian “militias” need to leave Iraq as the fight against Islamic State militants was coming to an end while in Riyadh where he engaged in rare high level talks with Abadi and Saudi Arabia’s King Salman. “Certainly Iranian militias that are in Iraq, now that the fighting against (the Islamic State group) is coming to a close, those militias need to go home,” Tillerson said during a press conference in Riyadh, just before boarding a plane for Baghdad. “All foreign fighters need to go home,” he added. Secretary of State Rex Tillerson meets with Iraqi Prime Minister Haider al-Abadi on Monday. Image source: Government of Iraq/Prime Minister’s office. Prime Minister Dr. Haider al-Abadi during his meeting with the American Secretary of State Rex Tillerson assured him that the fighters of al-Hash’d al Shaabi [PMU militias] are Iraqi fighters who fought terrorism and protected their country, they sacrificed in order to win against Daesh [ISIS], and that Hash’d al Shaabi is an official institution under the state. The Iraqi Constitution doesn’t allow for foreign armed groups under state institutions, and further said that we should encourage these fighters because they are the hope of our country and for the region. So it appears, based on today’s rebuttals, that the Iraqi government and its paramilitary forces increasingly see American troop presence as the actual foreign menace which potentially threatens Iraqi national sovereignty. Tillerson’s statements, however, are a reflection of the Washington foreign policy establishment’s increased frustration at Shiite-led Iran’s expanding sway in the region, especially in Syria and Iraq. US regional allies Saudi Arabia and Israel are arguably even more frustrated, reflected in the increasingly inflammatory rhetoric coming out of both countries, and the fact that the two former enemies are finding more and more common ground against Iran and Syria. But the US and its allies have created the very situation and conditions they now find untenable. In Syria the West’s fueling of an international proxy war for regime change pushed President Assad to increasingly rely on Iranian forces in a now more than 6-year long war against both homegrown and foreign Sunni jihadists. Furthermore, Iran’s chief paramilitary ally in the region, Hezbollah, has played an even bigger role in pushing out ISIS and other al-Qaeda linked insurgents from Syria’s major cities. In Iraq, Shiite parties have dominated politics since the U.S. toppled the Sunni-dominated secular Baathist regime of Saddam Hussein in 2003. Essentially, the neocons handed Baghdad to the very pro-Shia forces in Iraq that they now rant in frustration against, as is now commonly understood even among some of the very architects of Bush’s war. The ultimate fear from the perspective of the US-Israel-Saudi axis remains the possibility of, in the words of Henry Kissinger, “a Shia and pro-Iran territorial belt reaching from Tehran to Beirut” and the establishment of a supposed “Iranian radical empire.” For neocons, the next Middle East threat ever-looms ad infinitum (there will always be another boogeyman…and another, and another, and another…) as an excuse to maintain America’s “forever wars” in the region. And of course, Iraqi PM Abadi understands all of this very well – he further knows that American officials believe in the principle of “sovereignty” until they simply don’t, that is, up until the point that US allied sovereign governments refuse to remain pliant puppets of American interests. In this case, the some 80,000 to 100,000 Iraqi PMU militias perceived by the US as being under Iranian influence and serving Iranian interests are considered by American and Saudi officials as intolerable, even while they fight ISIS.